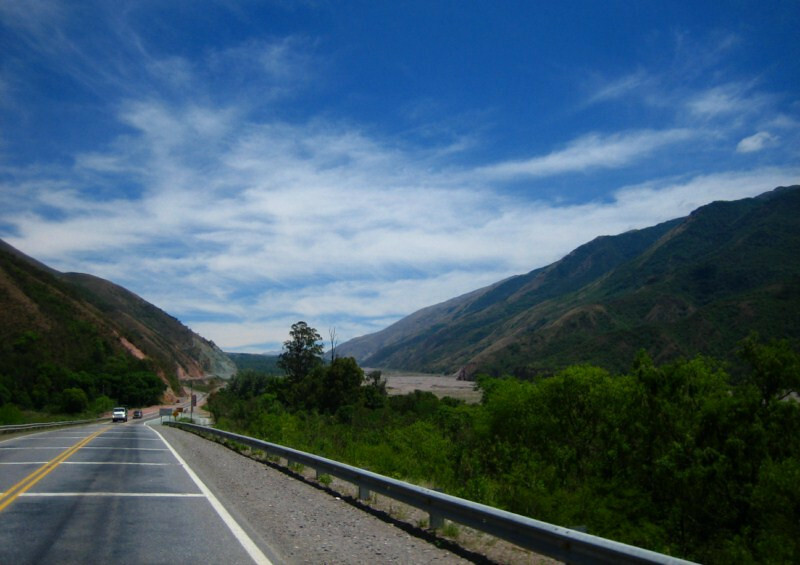 From Tucuman, the Andes are close by and I took a scenic route through the mountains to head north to Salta and onwards to Jujuy. 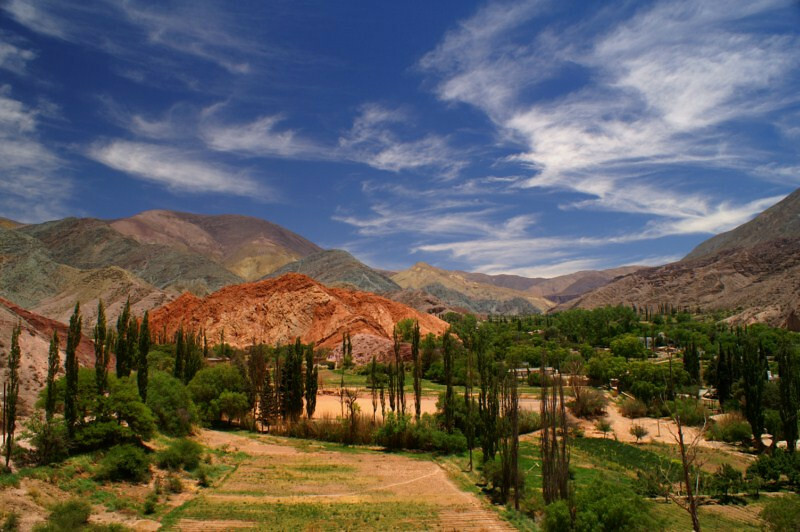 Northwest Argentina is famed for its colorful landscapes and wine culture. 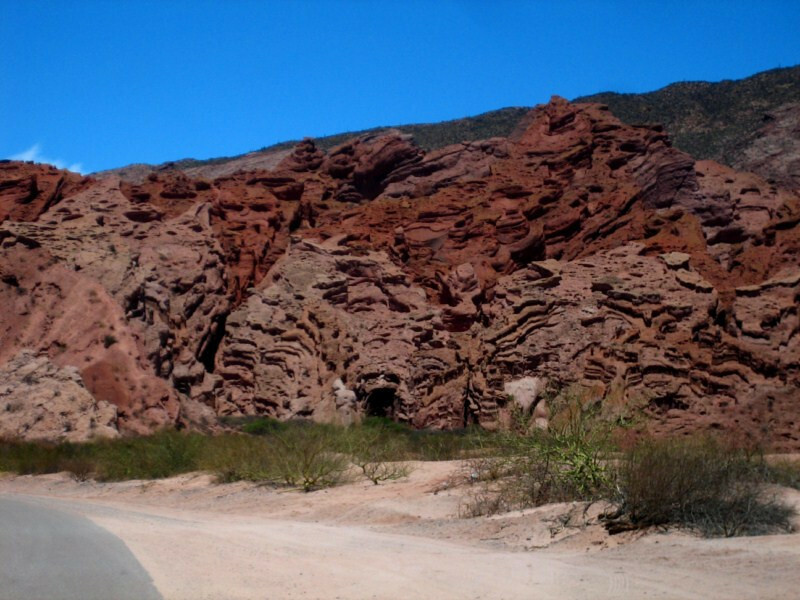 I took in the Quebrada de Cafayate and Humahuaca before exiting at Aguas Blancas. 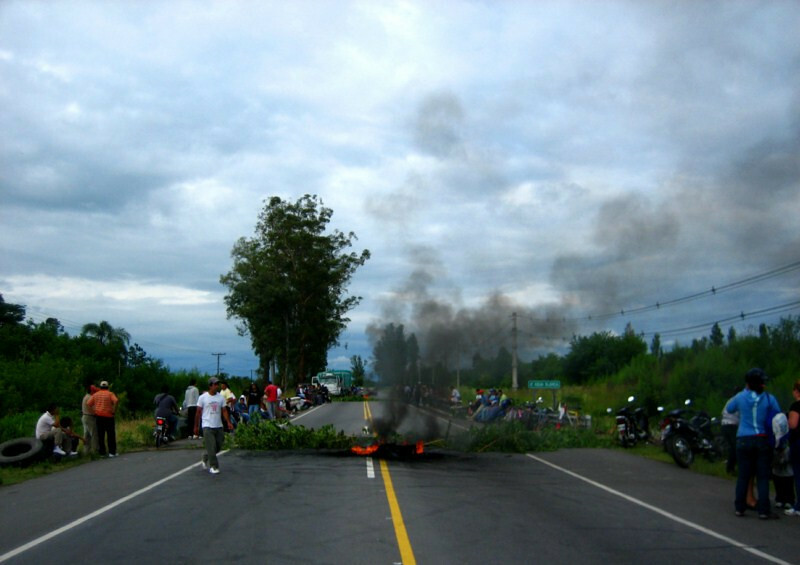 There was a road block as I exited Tucuman, heading to Tafi del Valle. 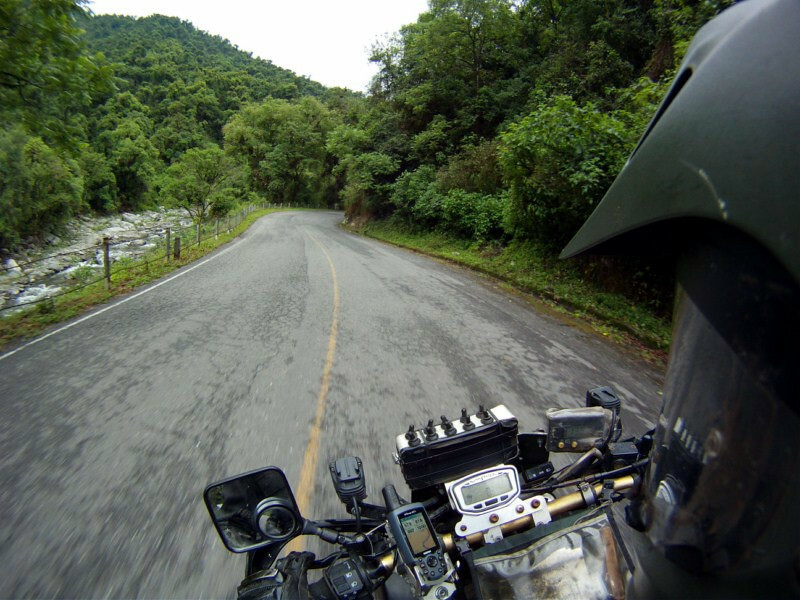 As is common during motorcycle travel, it’s always worth it to pull up and ask if you can pass since their grudge is probably with the government and they want to hinder commercial traffic, so I passed by on the shoulder. The atmosphere was quite festive with locals gathering and police slowing down traffic. 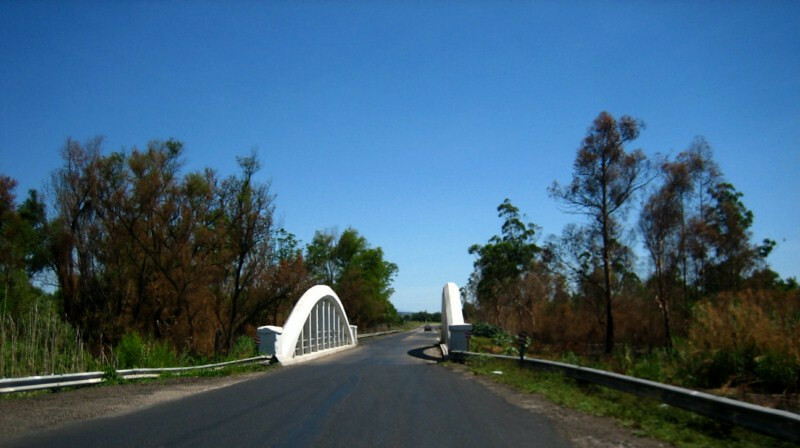 The road climbed up through steamy sub-tropical jungles and the narrow path added to the excitement. sanDRina was feeling quite chirpy. Ummm, Ok. End of the World? So, this is where it is. I guess I don’t need to go to Ushuaia then. 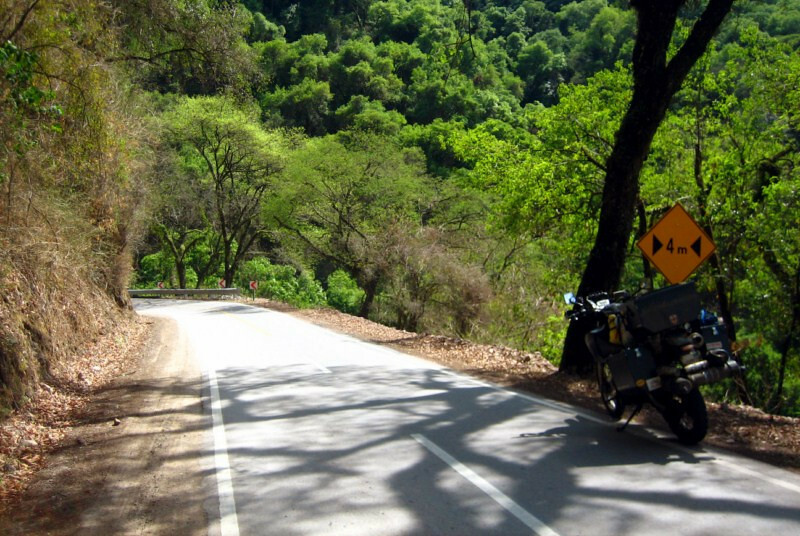 The world carried on and the twisties were sublime. 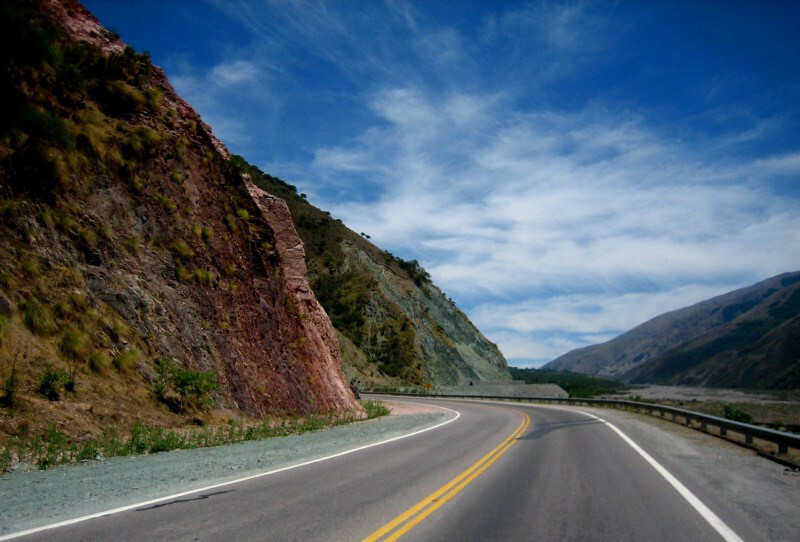 I passed the pleasant-looking town of Tafi del Valle, situated in a valley and being the weekend getaway for Tucuman residents. 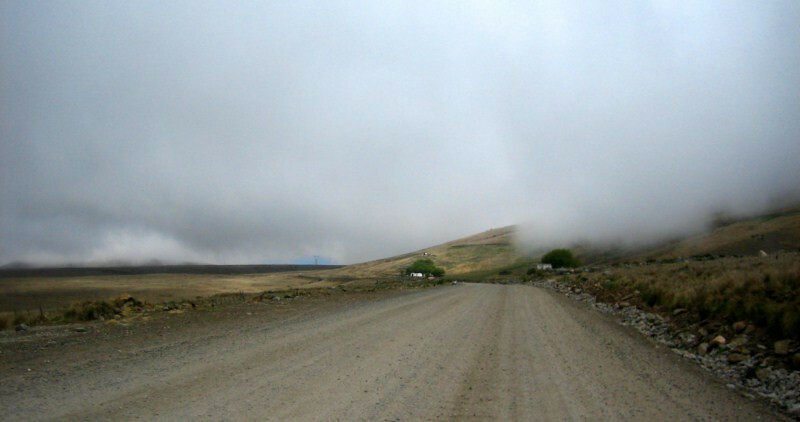 The road climbed past 2,000 m (6,560 ft) and turned to dirt near the summit. 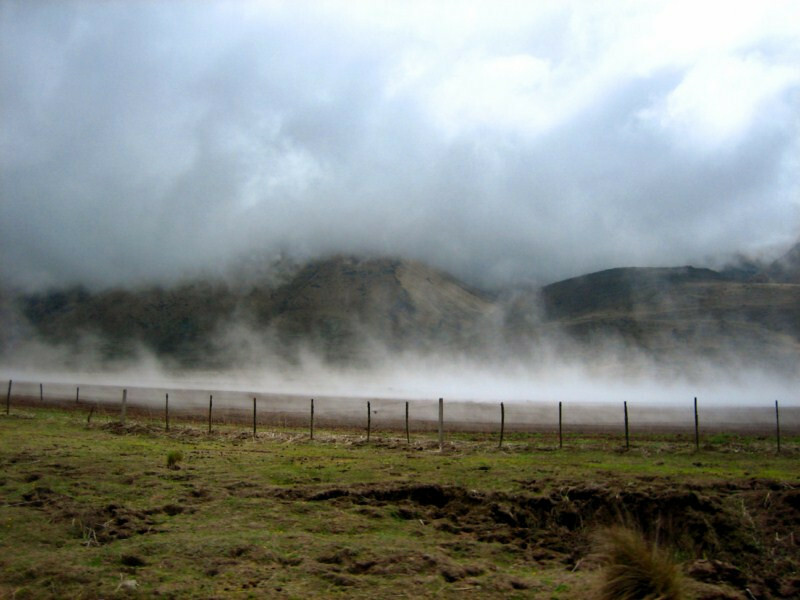 The moist farmland was exhaling clouds as the bright morning sun shone down. 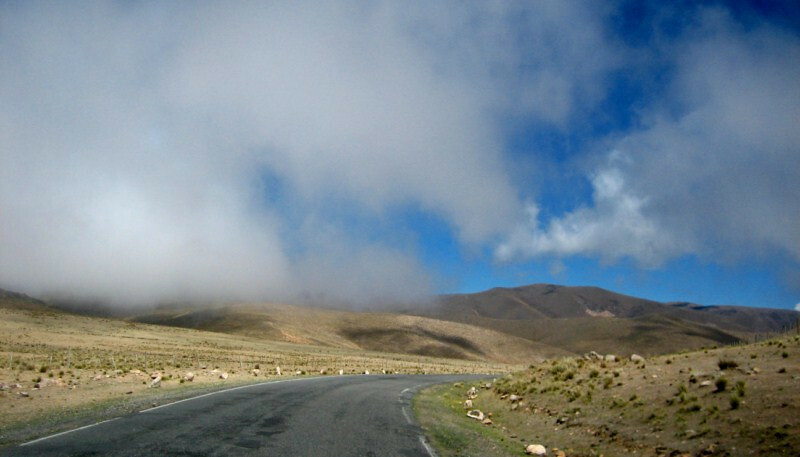 The road peaked near 3,050 m (10,000 ft) and the terrain resembled the altiplano. 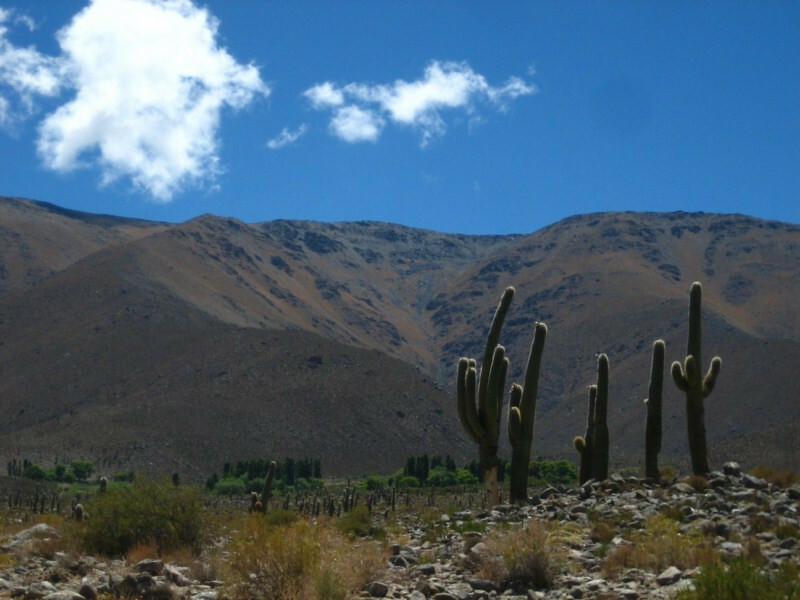 The difference in climate from one side of the mountain to the other was quite evident, being dry with cactus here and lush and wet on the other side, the effect of a rain shadow. 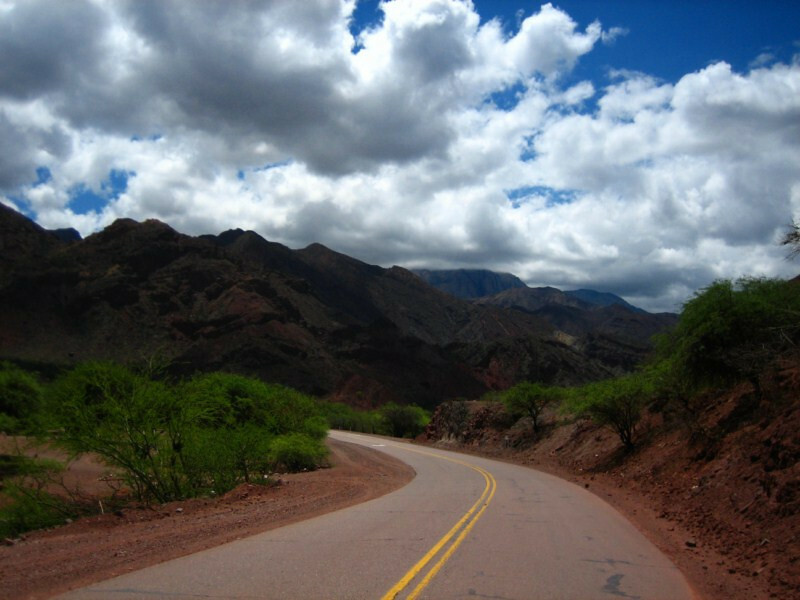 Heading down to take Ruta 40 north to Cafayate (pronounced ka-fa-jah-tay). 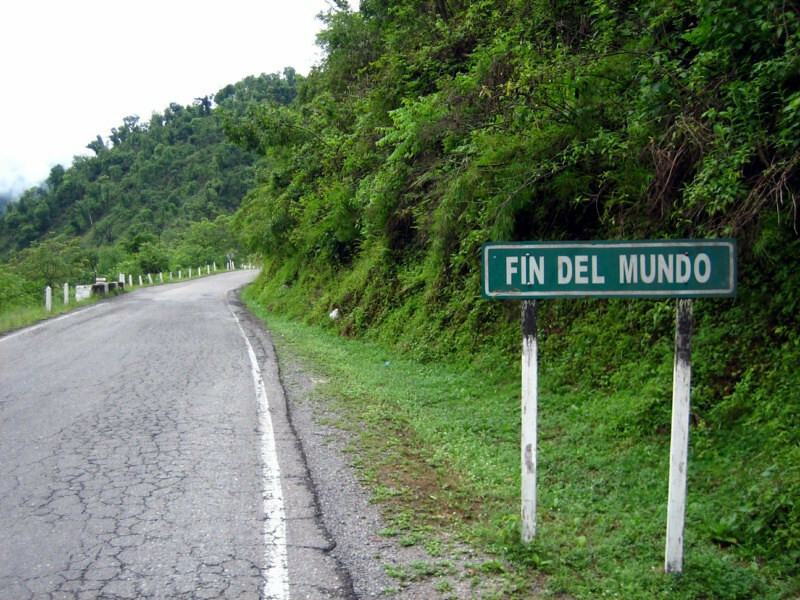 I would come back this way after my loop through Bolivia. Having some empanadas (turnovers) for lunch in Cafayate. 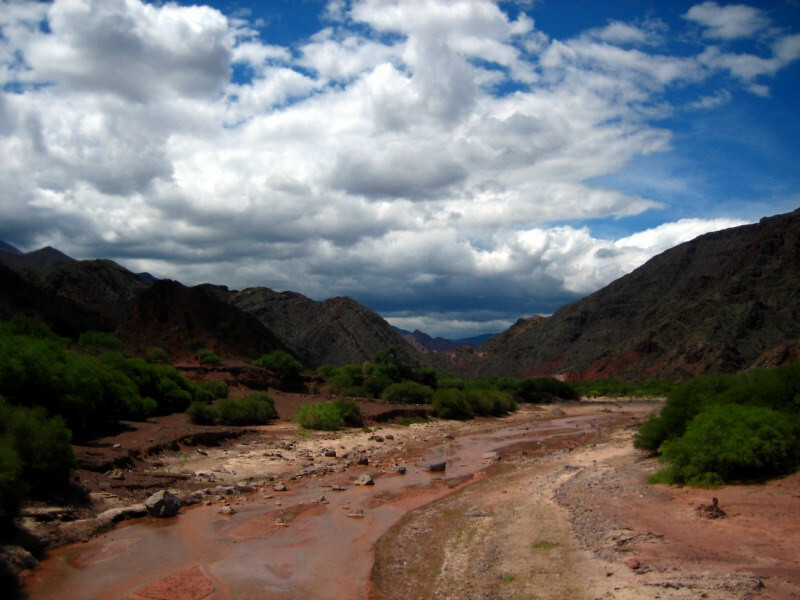 Besides wineyards, the town is known for the Quebrada de Cafayate (meaning canyon). It’s a picturesque canyon with dramatic natural sculptures in the wind-carved sandstone of its geology. Here you can see some ventanas (windows). The ride was picturesque and a marked difference after thousands of kilometers of flat land riding. The route passing thru a gate of sandstone. 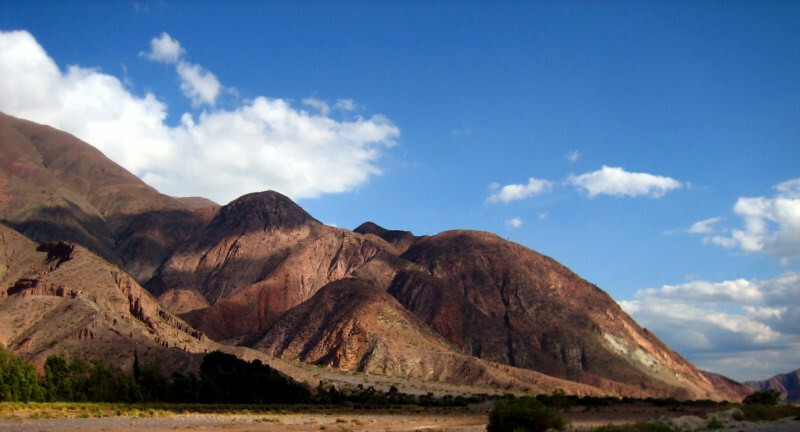 A wide-angle shot showing the scenery of the Sierra de Carahuasi, the backdrop for this stunning landscape. El Obelisco, a tower of stone carved by the hands of the wind. Flowing curves in the face of a hill, looking like successive strokes in a painting. The varied colors of the under-lying sandstone being exposed after the wind peeled back the covering. Passing by monumental structures of compressed sand, eroding at different rates based on their composition at formation. 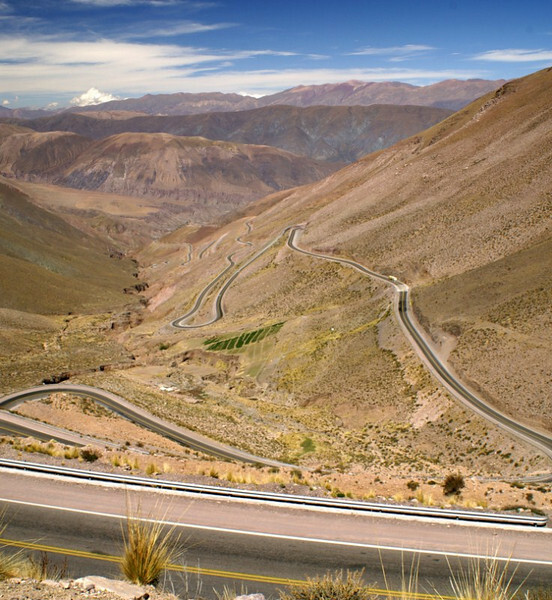 The elevation was about 1,600 m (5,250 ft) and the sights were enchanting along the whole route. 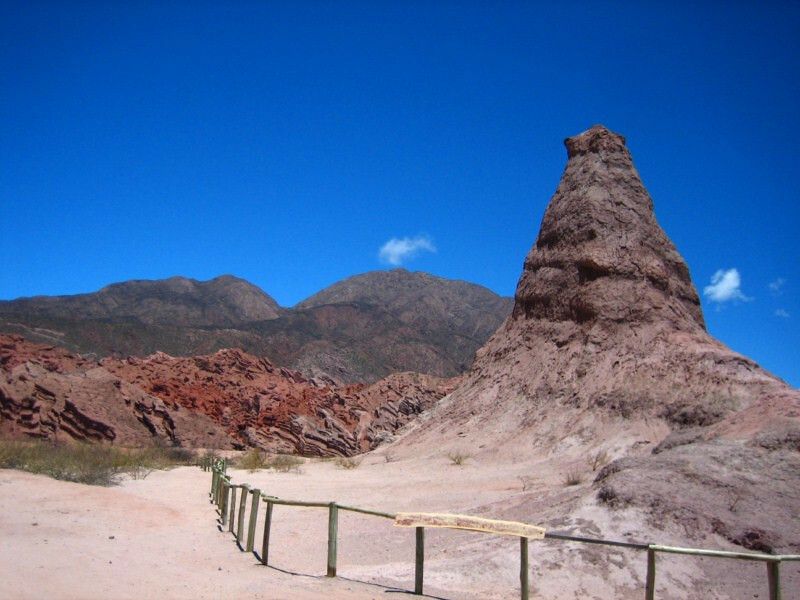 One of the marked attractions along the route, the Garganta del Diablo (Devil’s throat), a narrow, enclosed canyon with the sedimentary layers clearly visible. It was about 80 m (260 ft) tall and was probably carved by water. You can tell how god-fearing the populace is (was) with the association of the devil to scary-looking natural phenomena. A nice ride with very little traffic. Broad valleys being opened up by sediment-rich rivers, acting like sand-paper against the mountain’s face. 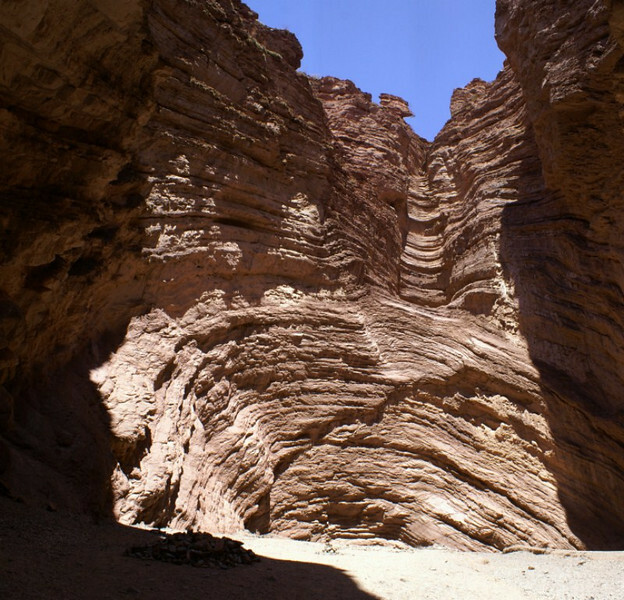 A panorama of a beautiful valley showing the exposed sedimentary layers and low shrub, characteristic of the canyon. 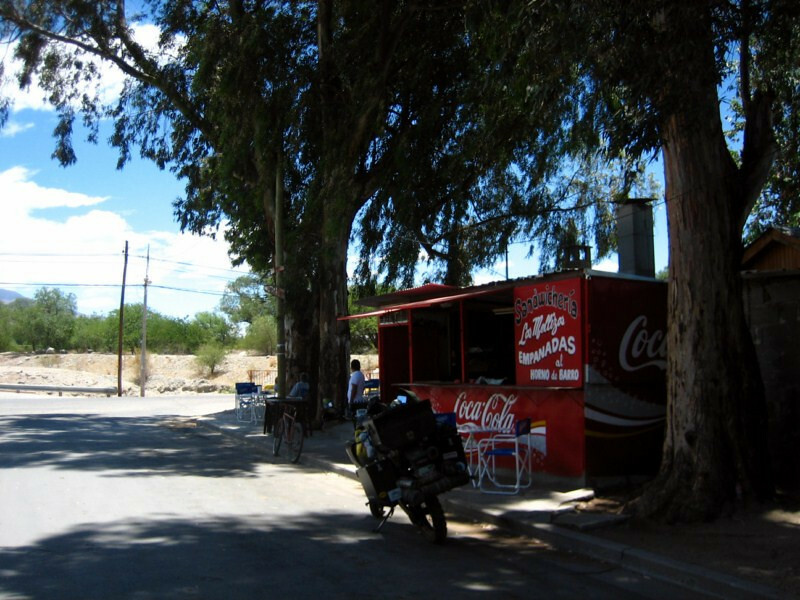 A shot of a typical petrol station in Argentina. 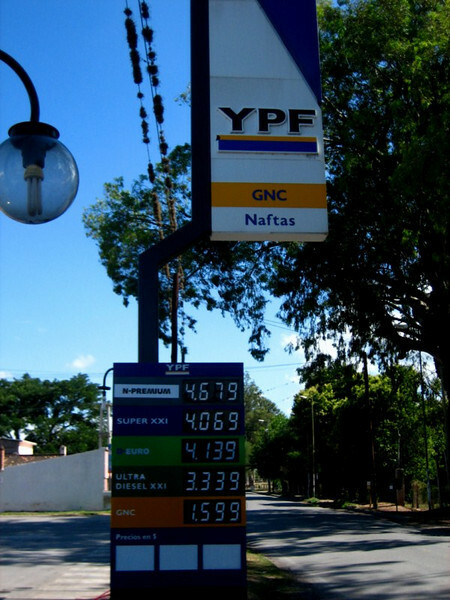 The national petrol company is YPF and they have stations in almost every town and are well-placed around the country. Petrol is called ‘nafta’ here. I think the word comes from naphthalene, rather than the North American Free Trade Agreement. Super XXI is the petrol I used and it’s rated at 95 octane. Sometimes, a Normal was available, mainly where farm equipment was nearby, but that’s rated at 85 octane and with the lowest acceptable being 87 for my bike, I stayed with the 95. The stations were well-kept and usually had a fancy convenience store attached. 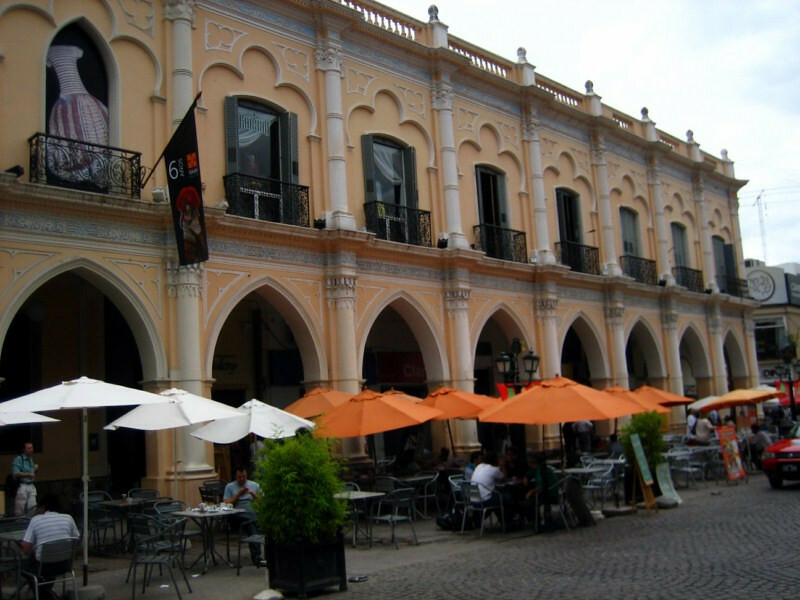 The central plaza of Salta, a city growing in popularity for its good looks and agreeable climate. 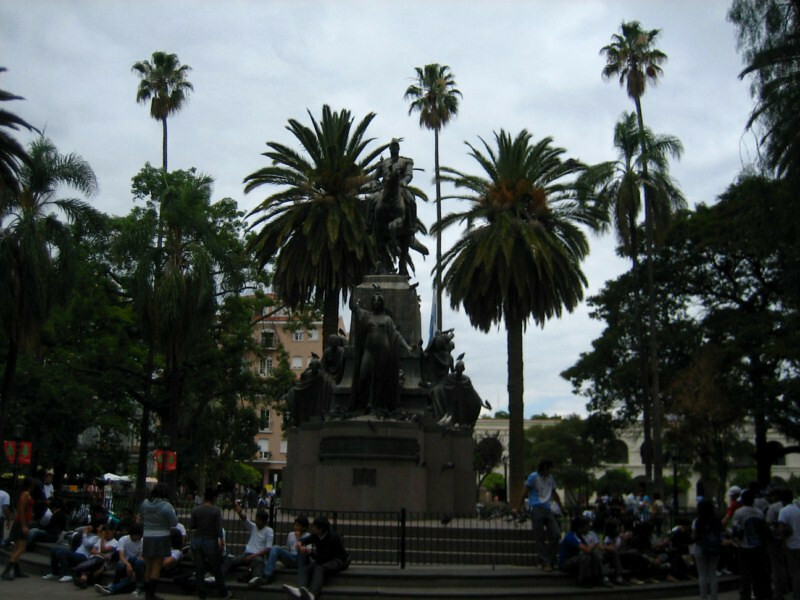 A statue of José de San Martín in the central Plaza 9 de Julio (date of independence from Spain). He was the principle freedom fighter for Argentina, Chile and Peru and carries the same significance of Simon Bolivar in the northern Hispanic countries of South America. I stayed with Noah and his wife Leigh, who recently moved here from New York City. Their daughter, Lila, is already bilingual and is trying to get Noah enthusiastic about this game she learned to play in school. He’s a mathematician and consults over the internet. 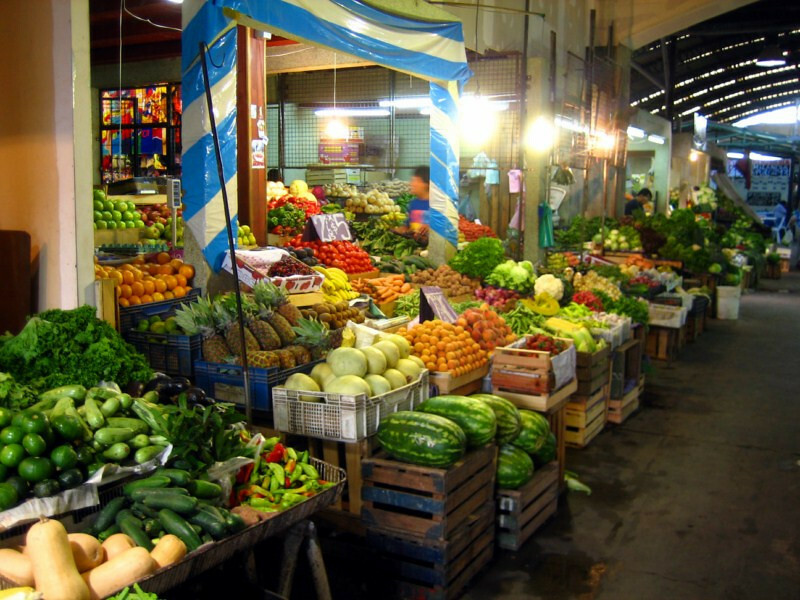 Buying groceries in the local market in preparation for a chicken curry that night. Noah was impressed that I was traveling with fennel (jeera in India) and referred to me as “The man who travels with fennel.” Would make a good book title, eh. 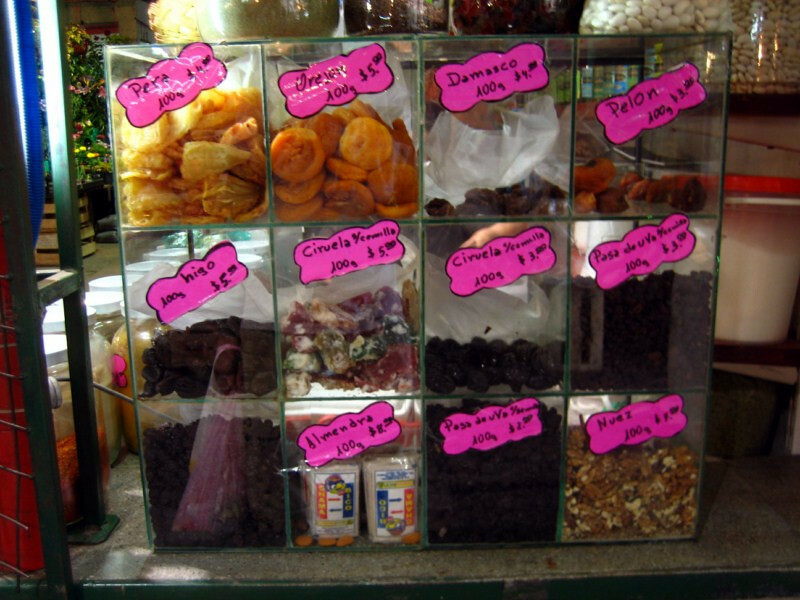 Picking up some dried fruits and nuts for the next leg of the journey to Santa Cruz in Bolivia. 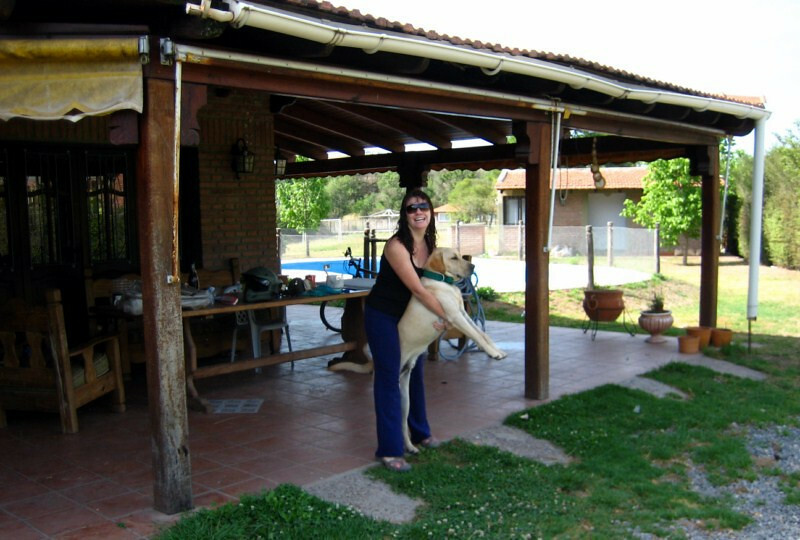 Leigh and her big labrador, Mani, saying good-bye. She consults in the social media world and both her and Noah are setting up an educational project at the local university and plan to be here for a few years, before moving on to another location. 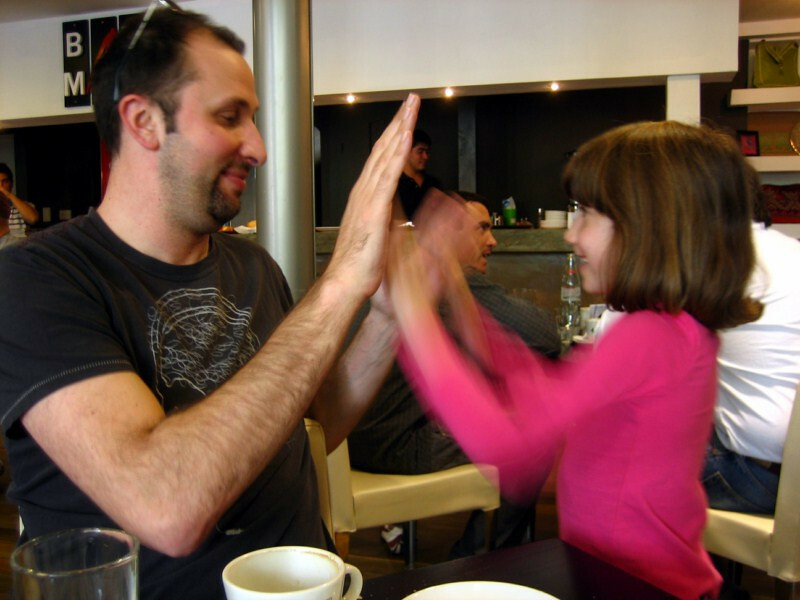 She’s traveled extensively and is now a CouchSurfing Nomadic Ambassador, fostering growth of the community where ever she is. 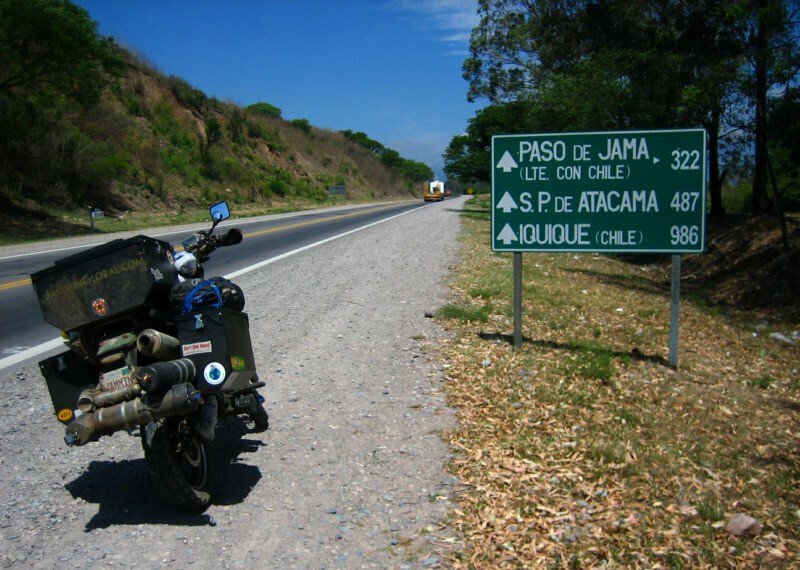 From Salta, heading north to Jujuy, there’s a narrow, twisty piece of road, Ruta 9, which is well-known in the motorcycling community. 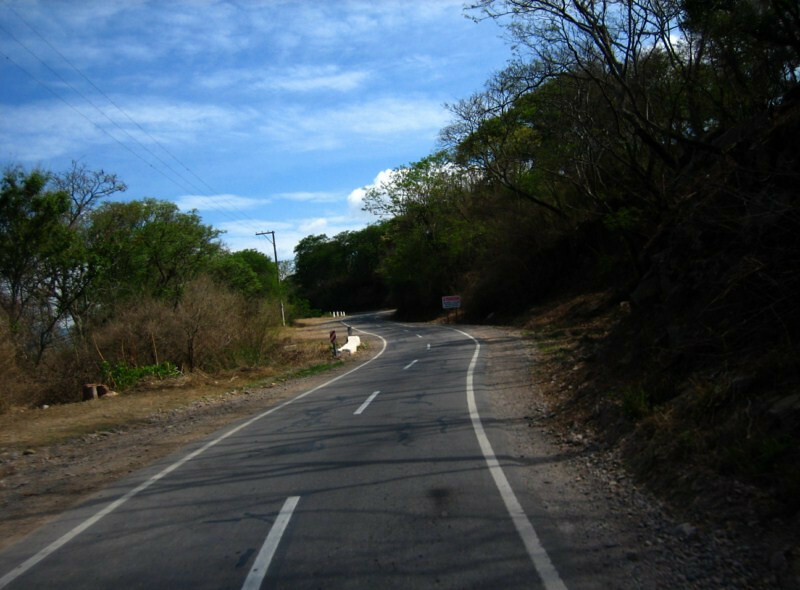 There’s a newer, faster, toll road to get to Jujuy and that’s a good thing, because all truck and most car traffic takes the new route, leaving this well-maintained stretch of twisty pavement to bikers. 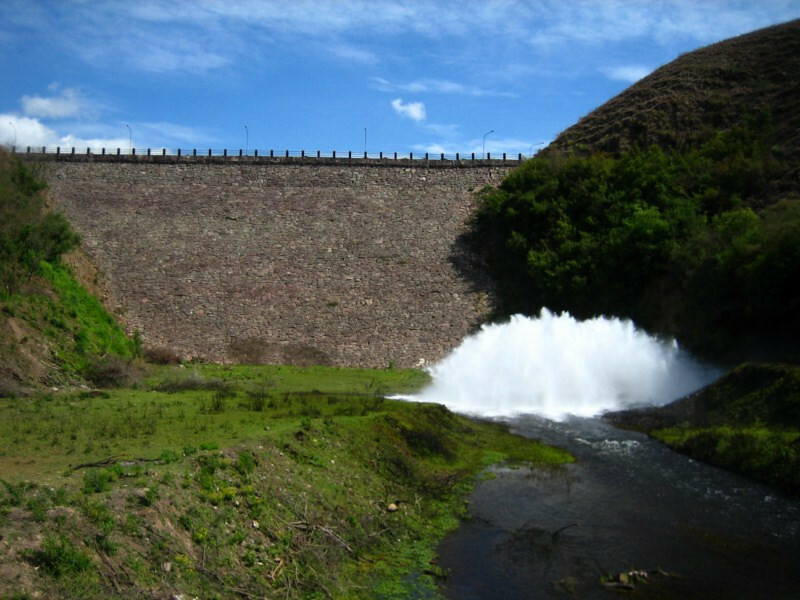 Passing by the Campo Alegre Reservoir with its sluice gates open. 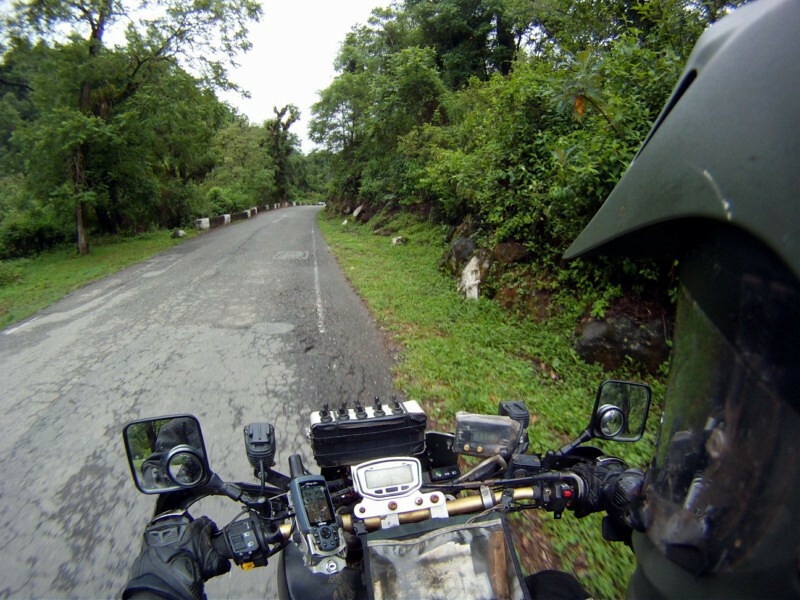 The route is very narrow and feels like a single lane road. 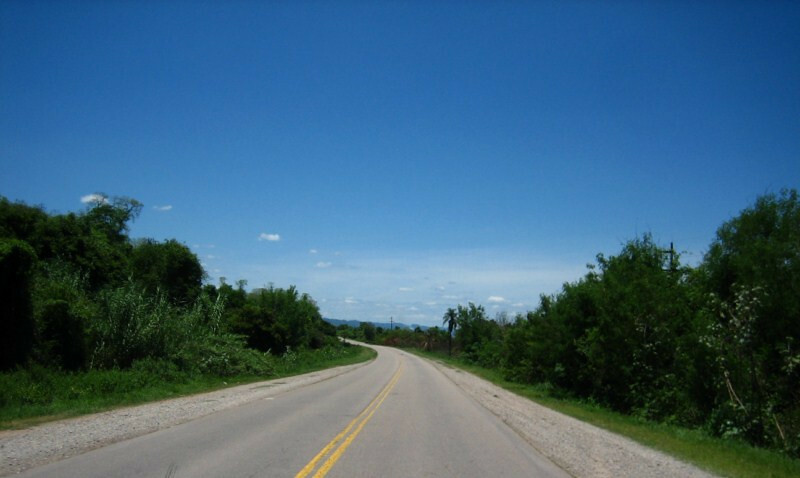 However, the narrower lanes are just perfect for motorcycles and this is what roads would look like if only motorcycles existed. Some bends are so tight, it’s one way traffic taking turns. I got behind a bunch of bikers and it felt like a local day ride. 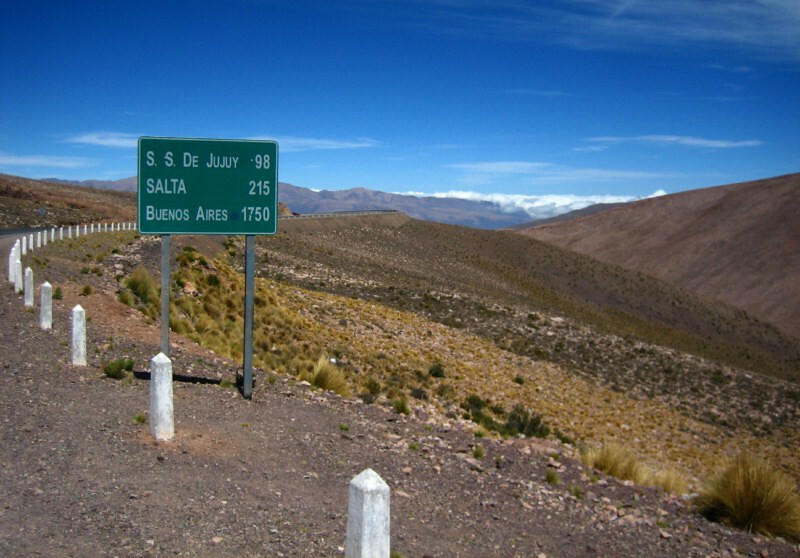 A distance board in Jujuy indicating the major mountain pass between northern Argentina and Chile, Paso de Jama, which I would be taking after my loop of Bolivia. 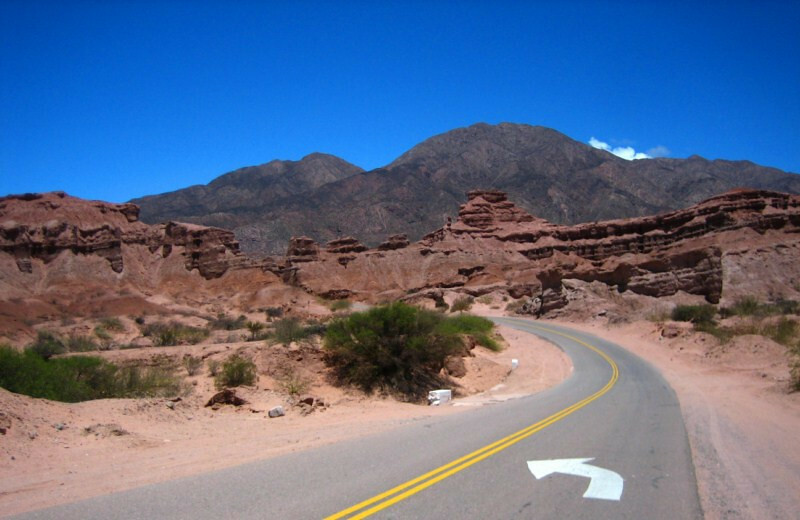 I was planning to spend the night in Jujuy and would be taking another route to the border, so I went for an afternoon loop through the Quebrada de Humahuaca. It’s a long canyon with varied colors of stones and minerals showing through on the barren hillsides. 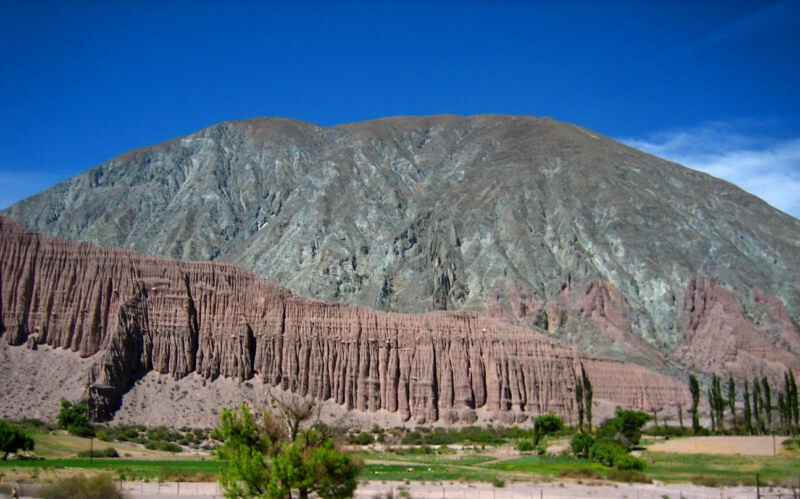 The seven-colored rock of Pumamarca. 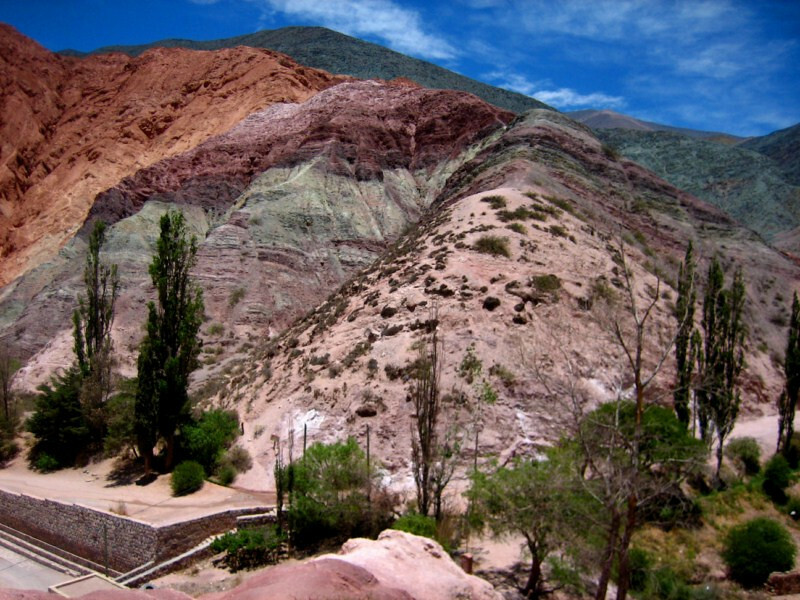 Different layers of exposed minerals giving the hillside its colorful appearance. The colors continue around the valley that this quaint village sits in, at the intersection to the road heading to Paso de Jama. A wide-angle view of all the colored rocks from Pumamarca. 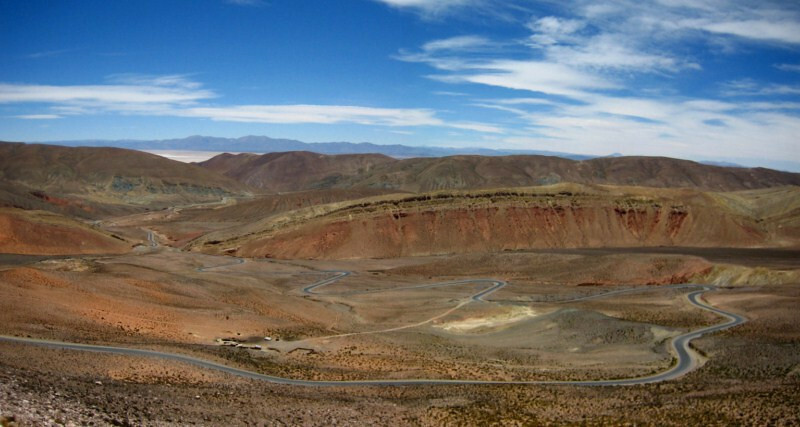 Heading towards Paso de Jama for the salt flats over the summit. 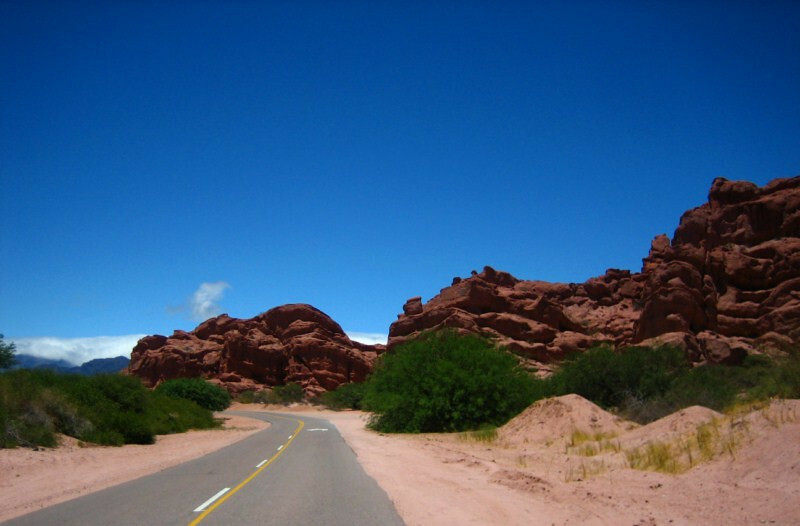 The whole route is lined with dramatic landscapes. Wind and water sculpting the sandstone. 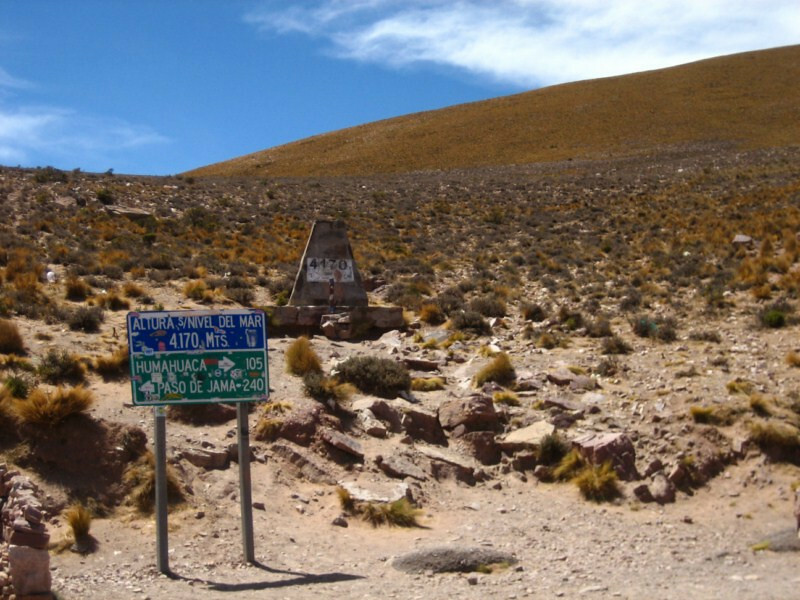 Crossing the summit at 4,170 m (13,677 ft). 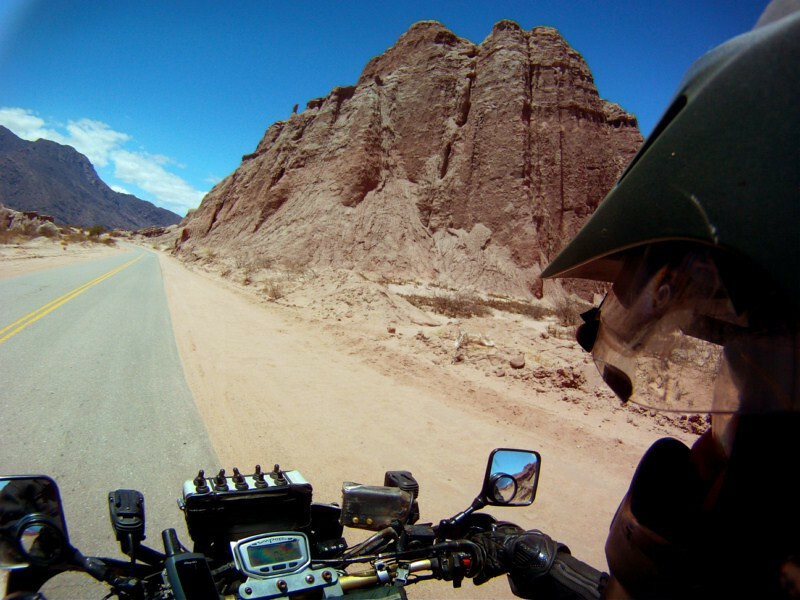 Getting a taste for the high-altitudes in the near future in Bolivia. From the summit looking west towards the altiplano down there and a slight glimpse of the reflection from the white salar past the mountain ridges. The route twisted its way down and with no traffic, it was a fun ride. 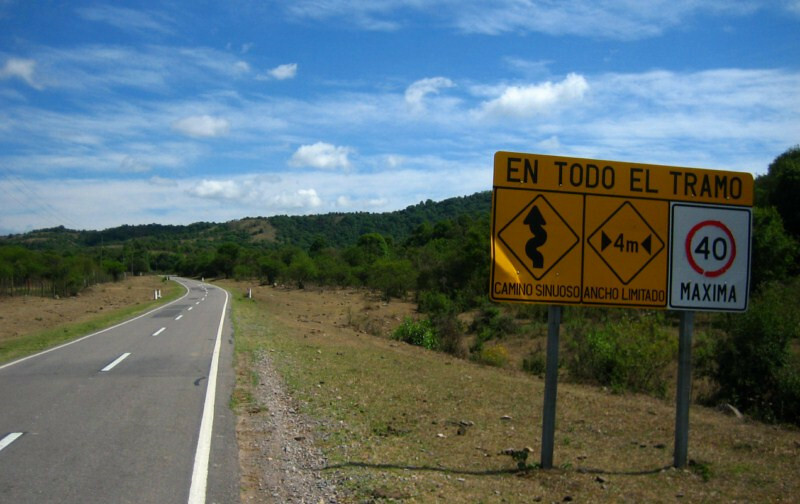 Road sign informing you of continued joy on sinuous roads with steep grades. 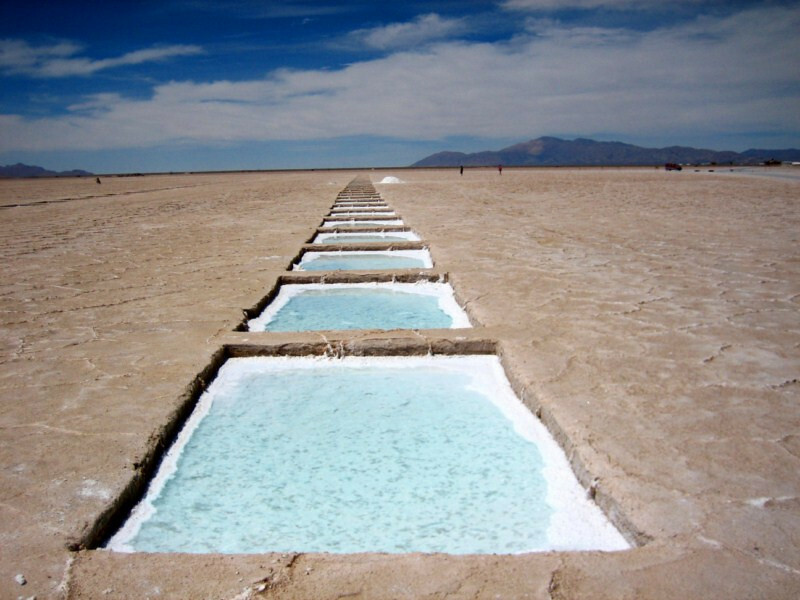 Salt production at the Salinas Grandes of Jujuy. 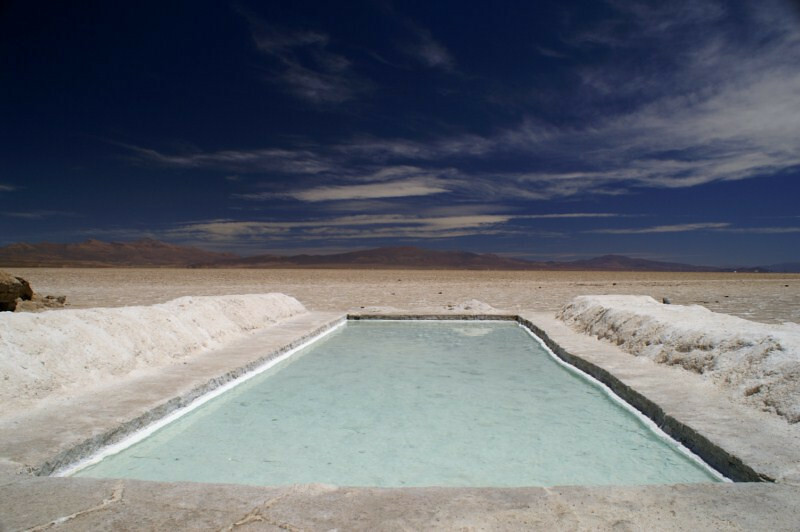 This salar (salt flat) is much smaller than the Salar de Uyuni just north in Bolivia, but still providing views worthy of a visit. 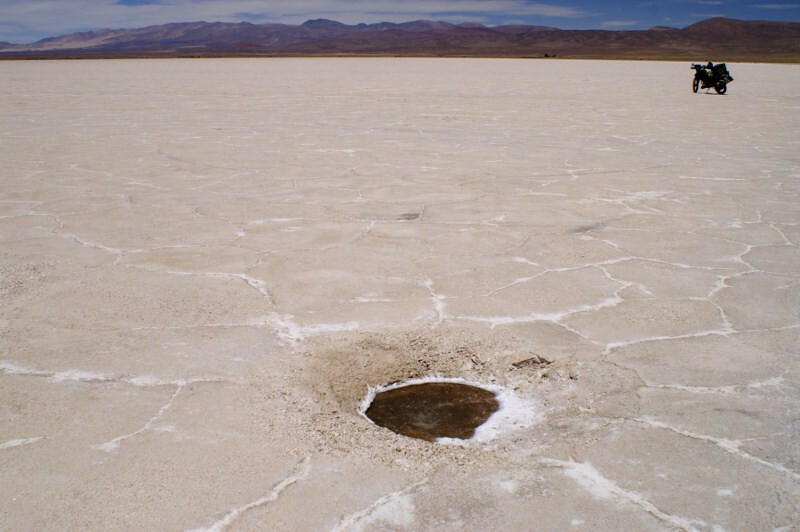 Ojos de la Sal (eyes of the salt), which are small openings in the hard crust showing the brine solution that lurks underneath. 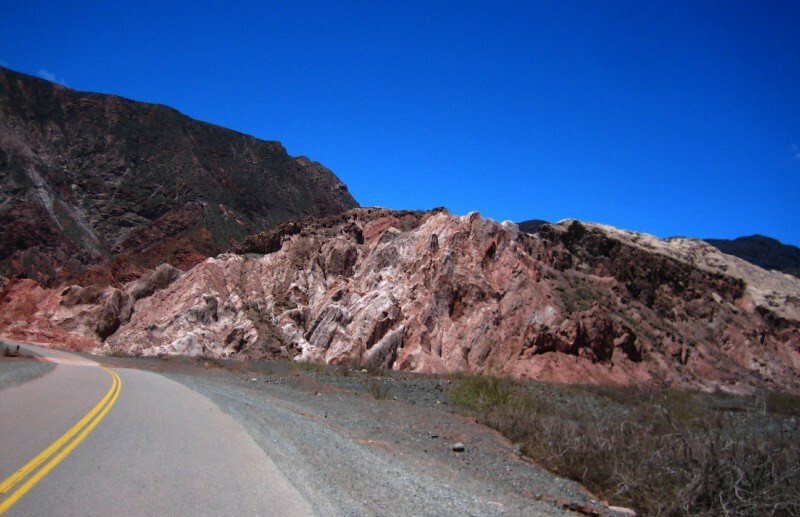 Heading back up the pass and seeing colored mountains at every turn. The terrain is harsh at this altitude but I caught sight of a few grazing antelopes. Distance board at the summit. 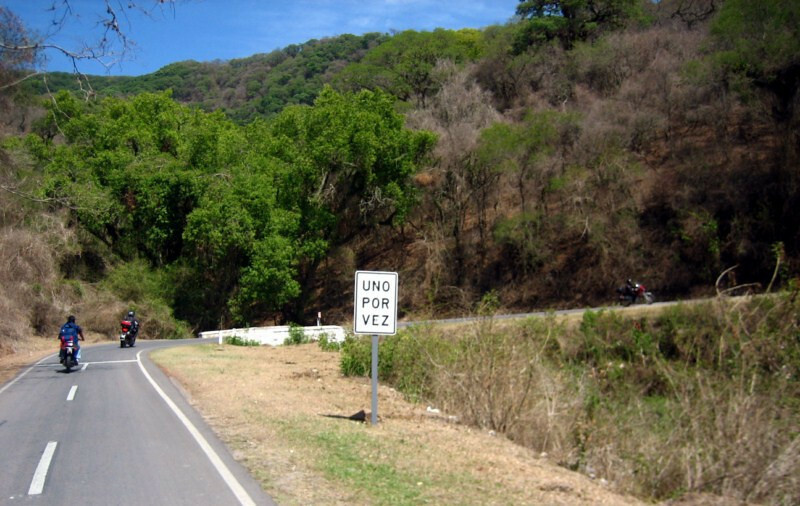 Heading east back to Ruta 9 and descending down the mountain with fun switch-backs. 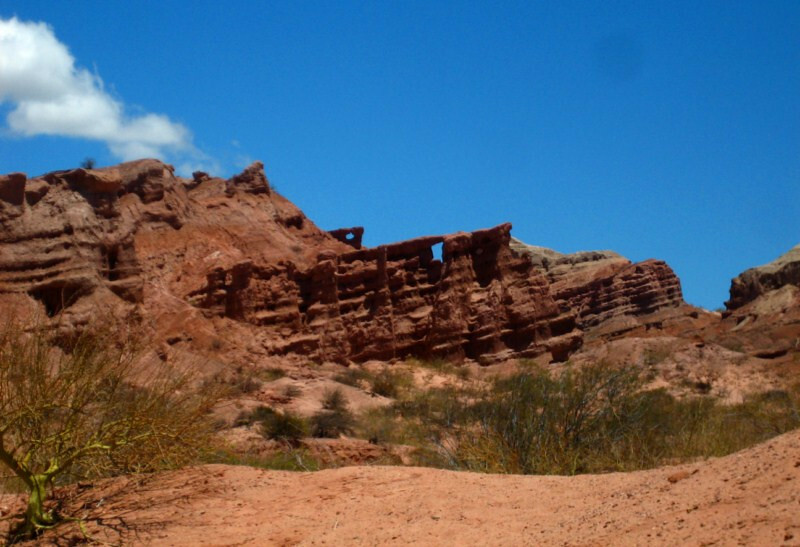 Back in the Quebrada de Humahuaca and noticing different colors with the afternoon sun against these hoodoo-like structures, where the softer sand has eroded quicker than the sturdier parts of the rock, leaving behind a structure of columns. The longer wavelengths of sunlight and the hindrance of clouds painting enigmatic shapes in the already interesting hillsides of this colorful canyon. 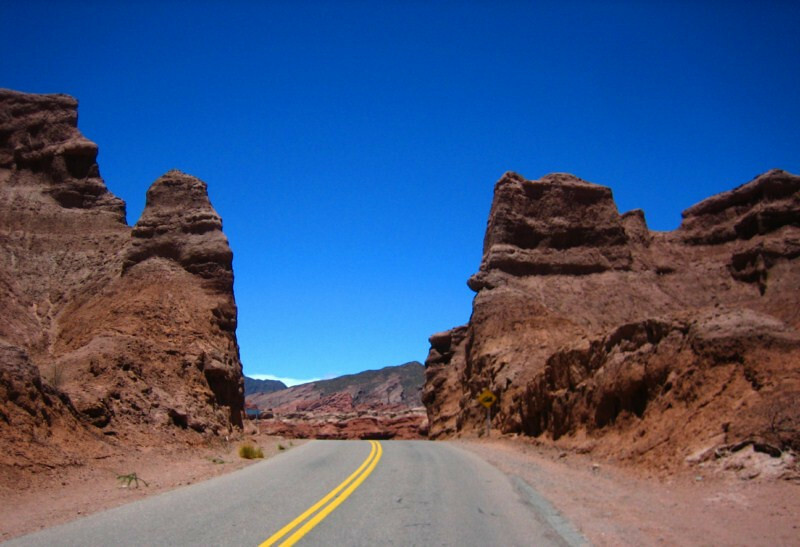 Finishing up a fun loop from Jujuy through an interesting array of geological masterpieces. Give Nature time and space and she will create a feast for the eyes. 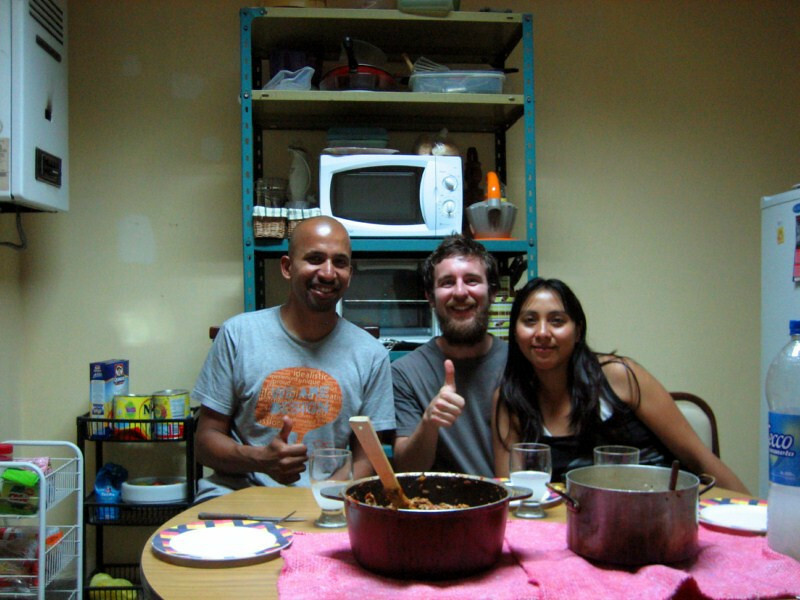 Sharing my curry with Julieta and Hernan in Jujuy. He runs an internet hosting service from home and she works at a school in town. They moved here from the busier side of Argentina to slow things down and enjoy the simpler things in life. 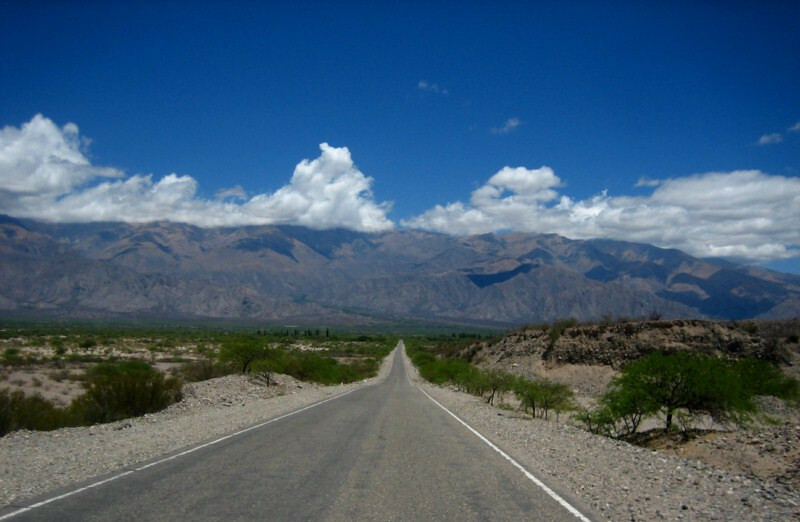 From northern Argentina, there are three borders with Bolivia and in order to make it to Tarija in one day, I took the flat route east towards Aguas Blancas. 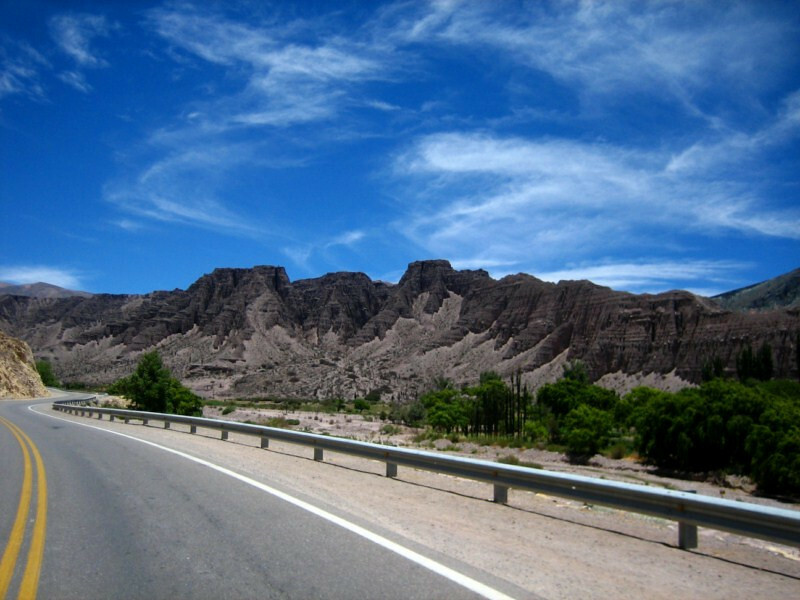 The temps were getting hot as the geography moved away from the Andes and towards the dry Chaco. 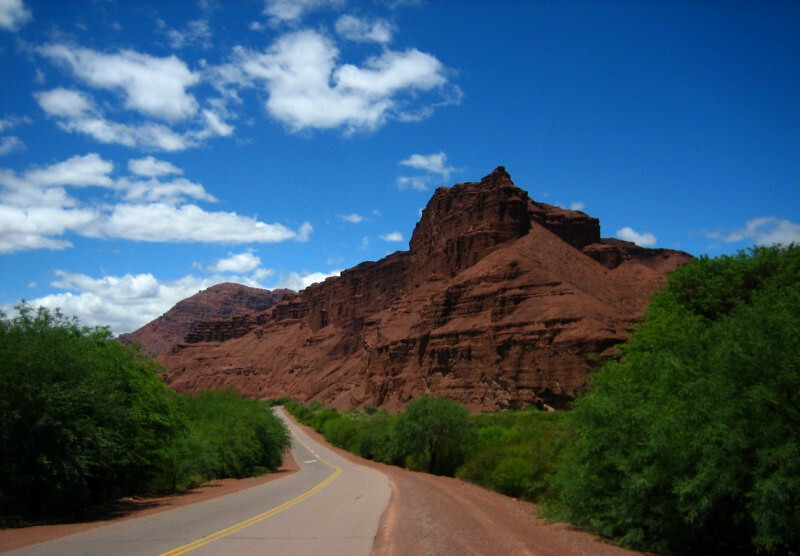 My tour of Northern Argentina was complete and while there weren’t too many attractive sights to see along the way, frequently staying with locals allowed me an insight into the culture with numerous assados and liters of maté consumed. 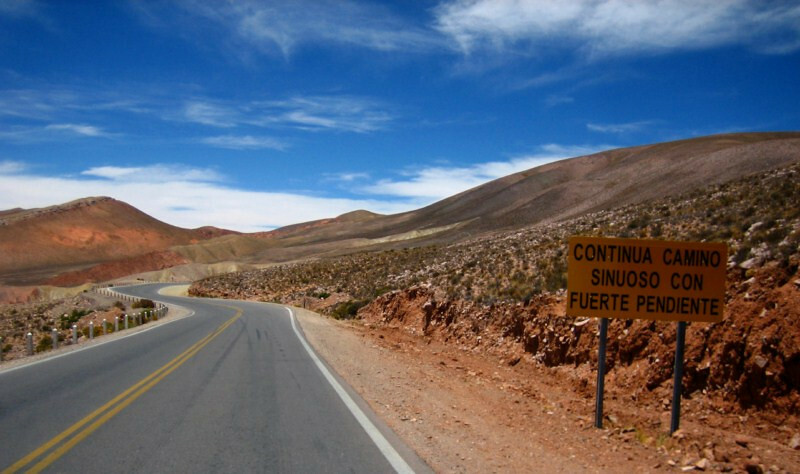 I felt secure and comfortable in Argentina and was looking forward to my second trip in the near future as I headed south to Patagonia. 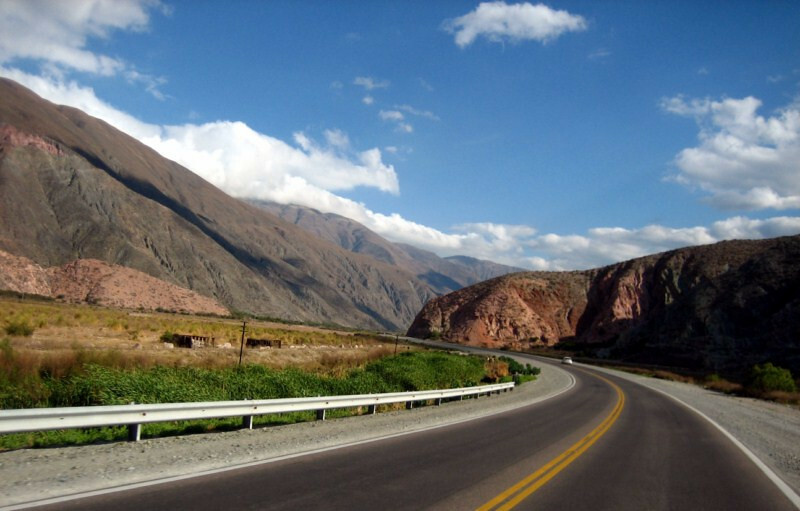 Now, the attraction of southern Bolivia lay ahead. Hey Jamin I wish I went we you Man. I from Argentina living in Las Vegas and I can wait to go back.